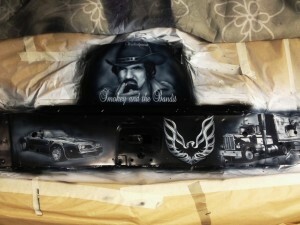 This is made on the exact same car as used in the movie Smokey and the bandit it was a very fun project to do. I watched these movies when i was a little boy and really loved them. This is my latest hockey masks ive painted i had a really good time airbrushing both of these masks. First one is a Stefan Liv memorial mask to remeber his wonderful career he really was a great goaltender. The second one is for TAIF swedish Allsvenska Hockey team and they wanted Rex hextall on one side and Bruce Springsteen on the other side and a classic simple design in white and green.